Who doesn't love a good hole? I had forgotten my love of holes until I was reading The Adventures Huckleberry Finn recently and was amused when Tom Sawyer suggests that by digging a good hole you come out in China. I chuckled and the memories of my journey to China came flooding back for the first time 40 plus years. I could see a beautiful summer day and I remember announcing to my parents that I was going outside to dig a hole to China. I got a response something like, “that’s nice dear.” I took that as words of encouragement. As a young boy, I saw this as support for my vision and encouragement of my endeavor. I enlisted my younger brother to help and off we went to an abandoned spot of un-manicured dirt in a corner of the back yard. With a shovel and a few spades on hand we started digging. As a parent today I can only conclude that my parents were simply happy to see us outside and engaged in a project. No one suggested for a minute that my goal might be unaccomplishable. After about an hour we had a small hole much wider than it was deep. Sadly the patch of dirt we chose seemed to be more rock than dirt and the tools proved ineffective at digging more a couple of inches. At that point the project was abandoned but the lack of accomplishment apparently never left me. Thinking back on it I wonder why my parents didn't become more engaged. Think of the learning opportunity that awaited if they asked questions like "How long do you think it will take? How far will you have to go? What will you do with all the dirt? How will you transport the dirt out of the hole once it gets deep?" But the thinking didn't end there. My son sat down to the dinner table a couple of days after reading that passage and out of the blue asked, "if you had a tunnel through the center of the earth how long would it take you to get to the other side?” What the kind of question was that? I started to respond with to his question with questions of my own, when he confidently said, "Thirteen minutes, exactly thirteen minutes." Exactly? "Yes," he said, "exactly." My son is 17 and well past the age that one thinks about digging a hole to China, but somehow realized that I was not. I needed to do the homework I failed to do all those years ago. I began to think through how I might go about digging my hole. Don't worry, I didn't invest too much time, but some well spent time with Google closed a long neglected chapter in my mind. The first bit of business was to figure out how deep this hole would be? About 8,000 miles. Wow, that a long way. If the hole was a yard in diameter I figured that would amount to about 44 million yards of dirt—give or take. I had no way to wrap my head around such a number but a few more clicks and I figured that if I could find a plot of land the size of Disneyland, I would have to pile the dirt 57 yards high. Ok, that seems doable. The next bit of research was a shock. I wasn't going to end up in China. In fact it doesn't matter where you live in United States. If you dig down you'll find yourself in the Indian Ocean. Does that mean it's less than 8,000 miles? I guess I should have been able to figure out that China wasn't on the opposite side of the globe. In fact the only place in the United States that might land me on land was if I lived in Hawaii where I might emerge in Africa. 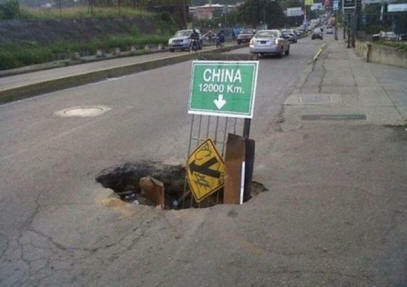 So where would you have to live if you wanted to dig a hole to China? Only one country—Argentina. This was a lot to absorb and enough for me to officially abandon my efforts. I stopped short of solving the problem of moving all that dirt and all the other challenges of digging through the center of the earth. It’s been a long time coming but I’m happy to report that simply writing this brief article has given me a level of closure that I forgot I needed. Yes, I was a failure at tunneling to China but if my grandchildren some day come to me and suggest we dig a hole to China I’ll be ready to help plan out the mission. Map of the other side of the earth.